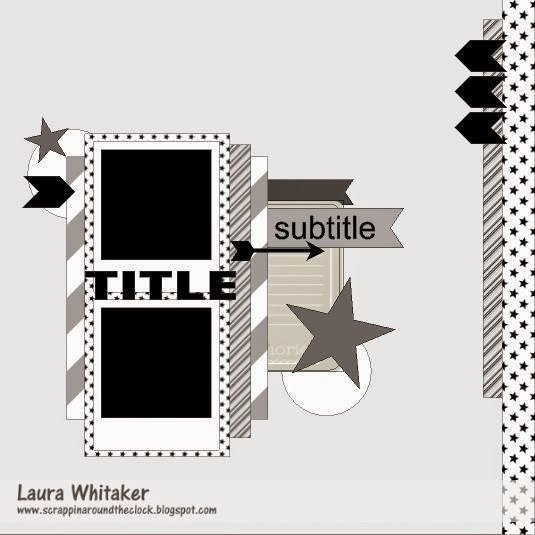 Boys Rule Scrapbook Kits: Guest Designer! Used tons of the Boys Rule kit on here - We R Memory Keepers and October Afternoon patterned papers, a Jillibean Soup Mini Placemat, a Carta Bella journalling sticker, a few Pink Paislee stars (that I inked with some Tim Holtz Ranger Distress Ink), some baker's twine, Authentique alphas, and that cork? I peeled it from some clothespins included in the kit. I also added some Creative Memories patterned paper, Tattered Angels Glimmer Glaze, Studio Calico wood veneer stars, a piece of Creative Imaginations corrugated paper and some stitching using a Close to My Heart stitching template with some DMC floss. Can't wait to scrap some more with this kit! There is SO much of it that I'll be able to do tons and tons of layouts with it for sure!! YAHOO! This is such a special layout for me as it's of a pic of one of my dearest cousins. Not quite six months apart, we pretty much grew up together. We've seen each other through all kinds of situations! I really wanted to find products that conveyed our relationship. And the Basic Grey Plumeria collection was absolutely perfect! A bit worn, a tad girly. Just like Lynn and me. I also added a Cosmo Cricket Tiny Phrase, a Close to My Heart hinge, Tattered Angels Glimmer Glaze, old cardboard I particularly loved due to its smaller than usual ridges (which I inked with some Ranger Distress Ink), a bit of stitching using one of my Bazzill Basics stitching templates and some DMS floss, and the chipboard title (also inked) that I remember receiving in a kit of a Trisha Ladouceur class I took ages and ages and ages ago. Want to see what the other Stuck?! Sketches gals came up with today? Hop on right over here. And if you link your own design based on today's sketch to today's Stuck?! 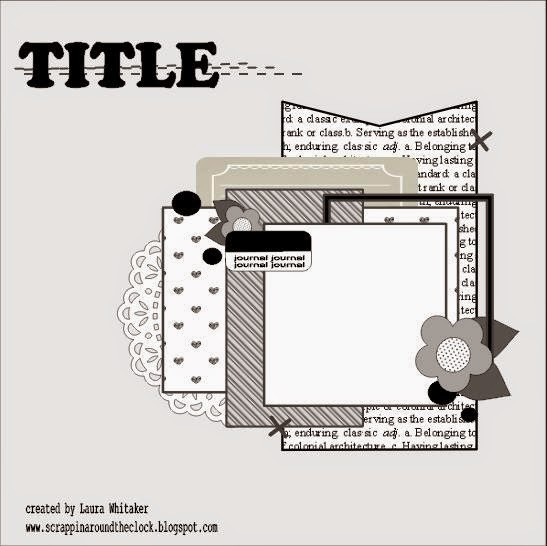 Sketches reveal, you'll get the chance to win some fabulous prizes - a $25 gift certificate for Creative Embellishments and/or a newly released product package of Linnie Blooms Mixed Media Products. YAHOO! I used a variety of stuff on this one - patterned papers by Glitz Designs, Crate Paper, Basic Grey, Bazzill Basics, and Fancy Pants, mesh by Magenta, alphas by American Crafts and My Mind's Eye, stitching using a Close to My Heart stitching template with DMC floss, banner stickers by Basic Grey, Tattered Angels Glimmer Glaze, Making Memories staples, used cardboard a scrappy friend of mine gave me ages ago (she was quite floored that I was still hanging on to it! ), and those black circles? The caps you take off from the Wink of Stella glitter brushes! I sewed them right onto the paper!! FUN!!! Want to see what the other Challenge YOUrself design team members chose as their words? Hop on right over here! And if you play along and link your own OLW design onto today's reveal over at Challenge YOUrself, you'll get the chance to win an awesome prize. WOO!HOO! With that in mind, may 2015 bring TONS of time to me, to you and everyone in between!! 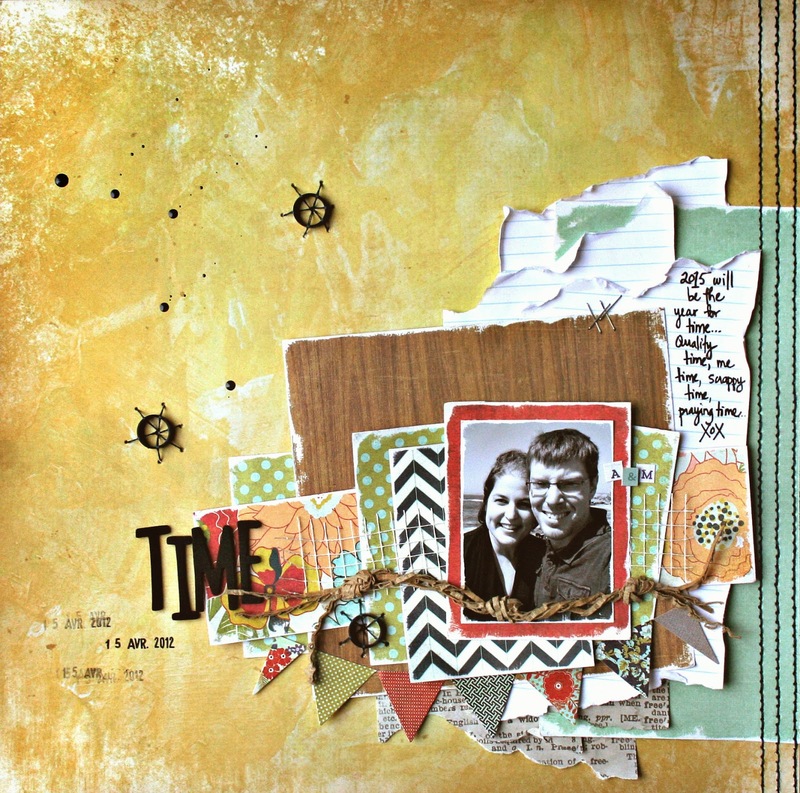 Tons and tons and tons of My Mind's Eye was used on this one from many collections - Lime Twist, Fly a Kite, Cut & Paste, and Stella & Rose. I also added a piece or two of Echo Park's A Boy's Life collection, Tattered Angels Glimmer Glaze, Making Memories staples, Studio Calico wood veneers, a Jillibean Soup wire word, stitching using a Bazzill Basics stitching template and DMC floss, pieces of corrugated paper from a random box, and some very effective Avery circle reinforcements. Nothing like going in my everyday stationary stash and finding things that fit perfectly for a layout! Want to see what the other Stuck?! Sketches girls created with this awesome sketch? Hop on right over here! 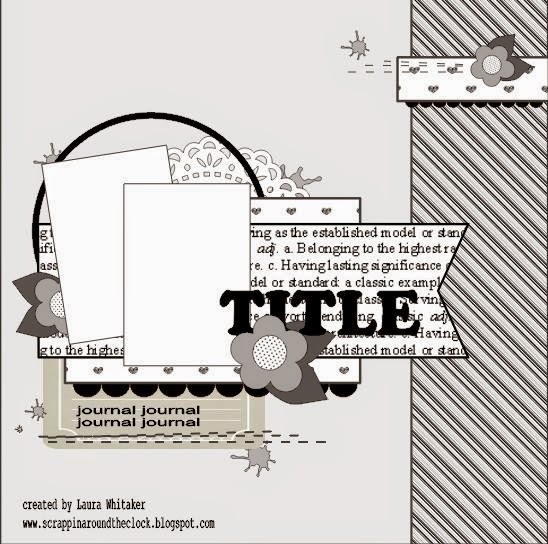 This sketch was lots and lots and lots of fun to work with so, go, and head to your scrap space and scrap away! ;) When you're done creating, link your design to today's reveal over at Stuck?! 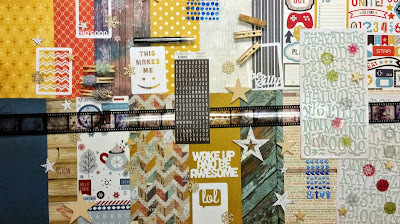 Sketches and be entered to win some awesome prizes - 2 large pieces of chipboard from Scrapmatts and a $30.00 gift certificate to Big Picture Classes!! You have until January 29, 2015 to link up your designs to the Stuck?! Sketches blog.